Audi's new Q5 SUV goes on sale in the U.S. next month. HERNDON, Va. -- Audis first entry in the premium crossover segment will be priced higher than most of its competitors. 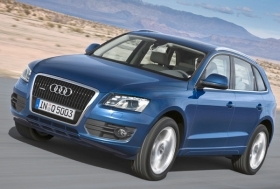 The Audi Q5 will go on sale in March with a base price of $38,025, including shipping. That is toward the upper end of a segment dominated by the Lexus RX 350. Audi announced pricing for the all-wheel-drive Q5 this afternoon. Minutes later, Lexus moved the bar, dropping the base price for the RX 350 for the 2010 model year. The 2010 RX 350, which arrives at dealerships this month, has a base price of $37,625 for the front-wheel-drive model, down from $38,525 for the 2009 version. The 2010 all-wheel-drive RX 350 starts at $39,025. Audi of America President Johan de Nysschen said this week heexpects the Q5 to deliver sales of about 1,000 units a month, most of them conquests of Lexus buyers. Other targeted competitors include the BMW X3, which starts at $40,525, and the Mercedes GLK350, which starts at $34,775. The Q5 also will be priced above the Acura RDX, Infiniti EX35 and Land Rover LR2 HSE. All prices include shipping. Its a very competitive segment and just about everybody is in there now with a new model, so its going to be interesting, de Nysschen told Automotive News in an interview at Audis U.S. headquarters here on Monday. The Q5 is derived from the same Audi platform first developed for the A4 model range. For the Q5, Audi widened the platform to increase shoulder room and give the driver a higher seating position. The Q5 will arrive in U.S. dealerships next week and will be offered in three equipment levels.